This could almost be the atrium of a modern hotel, but it’s a drawing (speculatively, presumably) of an ancient Egyptian house built to surround a central courtyard that seems perhaps to have a glass roof. 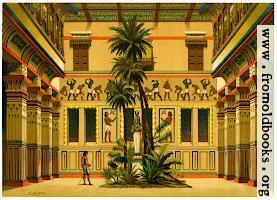 There are square pillars holding up the second floor and there’s a group of palm trees in the middle surrounding a statue. A barefoot man wearing only a loin-cloth stands in the middle distance holding a spear. 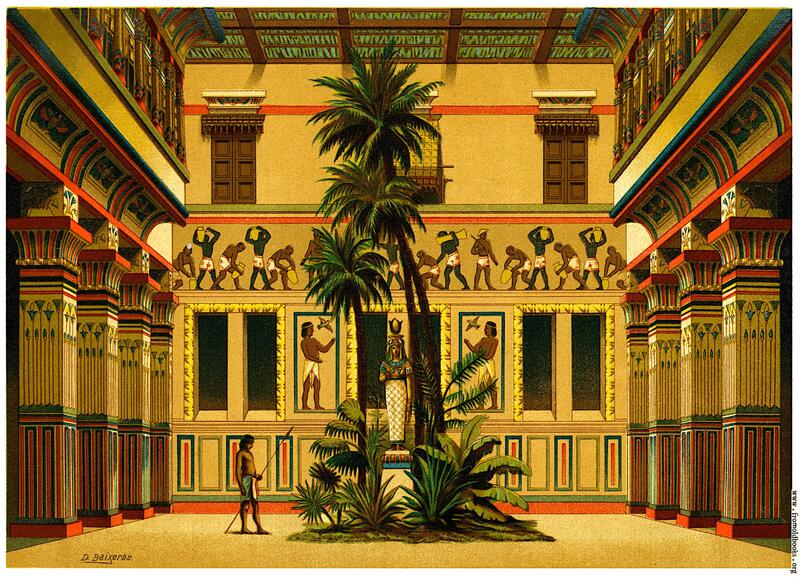 The walls of the courtyard are bright yello with red decoration and in the background the far wall has a frieze showing people in patched underpants carrying various objects or pouring water, and also two pictures of men in loin-cloths with birds. I brightened this picture up considerably, not being certain how much (if at all) the ink had faded.